The Company makes allocations for non-commercial projects, contributes to financing socially important programs of public organizations and charitable funds aimed at revival and preservation of spiritual, cultural and historic heritage, development of sports, support for healthcare and education. One of the main investment patterns is the support of science and education. The company provides financial support for general educational institutions, industry-specific school, as well as research projects. In 2014, the third stage of the expedition "Pole of Cold” called "Antarctic-100" was sponsored. "Pole of Cold" is a multi-stage research project aimed at study of aquatic ecosystems of the Arctic Region, Antarctic and the Extreme North, as well as practice of diving methods in tough conditions and the study of the human performance. With the financial support of OOO ONH-Holding, underwater research team of the Regional Office of the "Russian Geographical Society" in the Republic of Tatarstan, a dive for a depth of 97 meters has been successfully conducted in the waters of the Antarctic for the first time in the world. A series of deep diving was conducted, in which a method was practiced that will further allow divers from around the world to carry out works related to the study of undersea habitat with less hazard to life. During the expedition, domestic equipment for diving was tested in-situ, developed by NPP "Respirator". According to the conclusions drawn from the results of tests carried out, domestic equipment analogue is not second to corresponding nondomestic instruments in quality. In addition, a record dive to a depth of 97 meters was carried out off the coast of the sixth continent of the Earth reaching the bottom of so-called Southern Ocean. The remarkable thing is that dives for a depth of not more than 20 meters are considered to be life and health friendly in this region. In 2015, the first stage of the Project "13 Seas of Russia" of the "Russian Arctic Circle» expedition was financed. . The Project "13 Seas of Russia" is a large-scale expeditionary project, during which diving with Russian equipment will be carried out for depths record for scuba divers in the seas sweeping Russia. Approximate project implementation period is from July 1, 2015, to December 2020. The result of the project will be a series of documentary films about expeditions and seas of Russia. The first stage of the Project, the expedition "Russian Arctic Circle" was implemented from 1 to 21 July of the current year. In the course of it, scientific and practical tasks were solved. Members of the expedition have collected unique data on the state of flora and fauna of the coastal waters of Murmansk at a depth of over 40 meters. Obtained samples and observations were transferred to specialists of Polar Research Institute of Marine Fisheries and Oceanography n.a. N.M. Knipovich. The institute has not studied marine organisms at such a depth before. In the course of the expedition, pattern of teamwork was practiced during deep diving under extreme conditions. Gained experience will enable the development of a common practice of diving organization with the use of breathing gas mixtures and integration into the practice of scuba divers worldwide. One of the expedition goals, namely testing of Russian diving breathing equipment, was solved by reaching to a depth of 111 meter, which is the record for the Arctic Circle. The project was developed and implemented by an underwater scientific and research group of the Russian Geographical Society n.a. A.A. Leonov together with the Division of the Russian Geographical Society in the Republic of Tatarstan with the support of All-Russian Public Organization "Russian Federation of Underwater Sports" and All-Russian Public Organization "Russian Confederation of Underwater Activities”. In 2016, the second stage of the Project "13 Seas of Russia" of the "Russian Arctic Circle» expedition was financed. On February 12, the second stage of "13 Seas of Russia" Project of the Russian Geographical Society Regional Branch started. The expedition consisted of two parts. The first part comprised training on Onega Lake and participation in the festival “Russian Ice”, as well as in research and practical conference “The Arctic- Territory of Safety”. 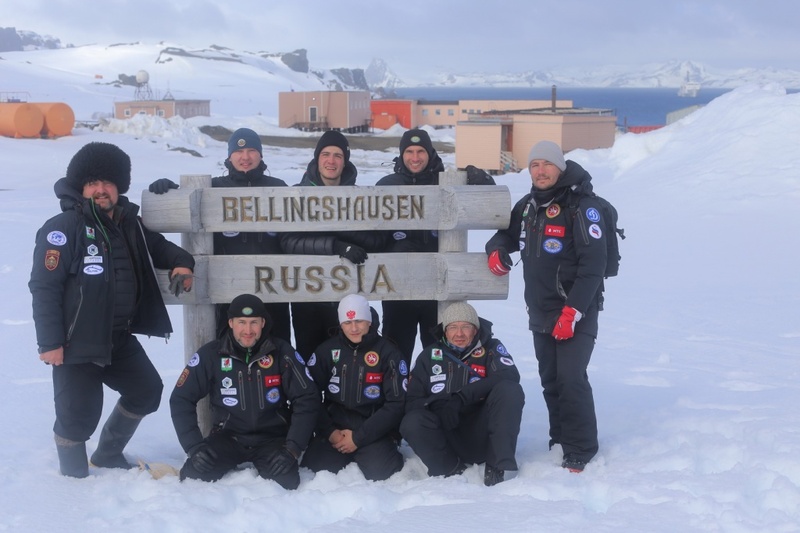 The second stage of the expedition was training in Lomonosov Moscow State University Centre for underwater studies “Polar Circle” on the White Sea. Team members together with the Invertebrate Zoology Department of MSU Faculty of Biology took water and soil samples to determine population of microscopic crustaceans Tantulocarida in winter. On March 5, members of the underwater research and development team of the Russian Geographical Society n.a. Aleksey Leonov established a world record by diving under ice in the White sea. During test of the Russian underwater breathing equipment, divers reached a depth of 102 m. This fact was documented by Bojana Ostoyich, a member of the Jacques-Yves Cousteau team and a member of board of directors of the World Confederation of Underwater Activities.